Musikmesse 2014: UK amp firm Orange, usually easily recognisable by it's radiant namesake finish, has announced a limited edition white finish option available on all of its Rockerverb amps, Thunderverb 200 and 50 heads and it's cabinet range. 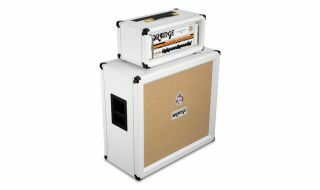 Orange Amplification are launching a limited edition white finish of their Rockerverb guitar amp heads and combos, Thunderverb 200 and 50 heads and legendary PPC412 and the more compact PPC212 Speaker Enclosures. For a limited time only, these sought after heads and speaker enclosures will be available finished, as never before, in a prestigious white Levant covering trimmed with traditional gold piping and gold capped handles. These elegant amplifiers and cabinets are the ultimate in luxury! The Orange Rockerverb series, long regarded as a British guitar amp masterpiece, are highly versatile roadworthy amps covering a wide range of tones. MusicRadar readers voted the Rockerverb 50 Combo one of the best valve combo guitar amps in the world in 2013.